I’ll let this soak in. 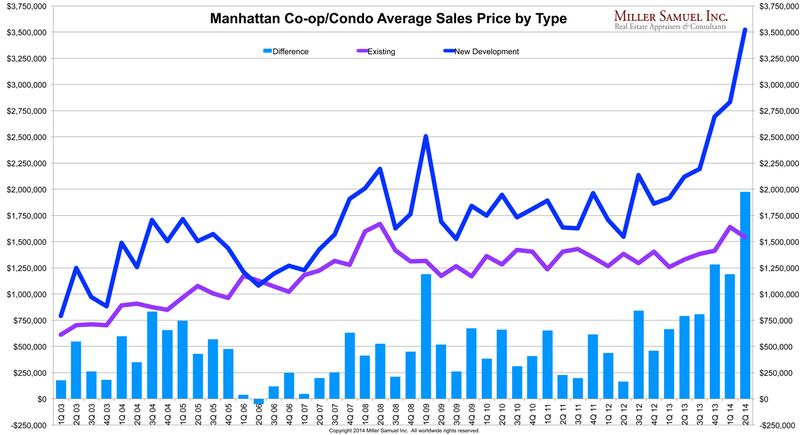 New development sales are significantly detached from the balance of the market. 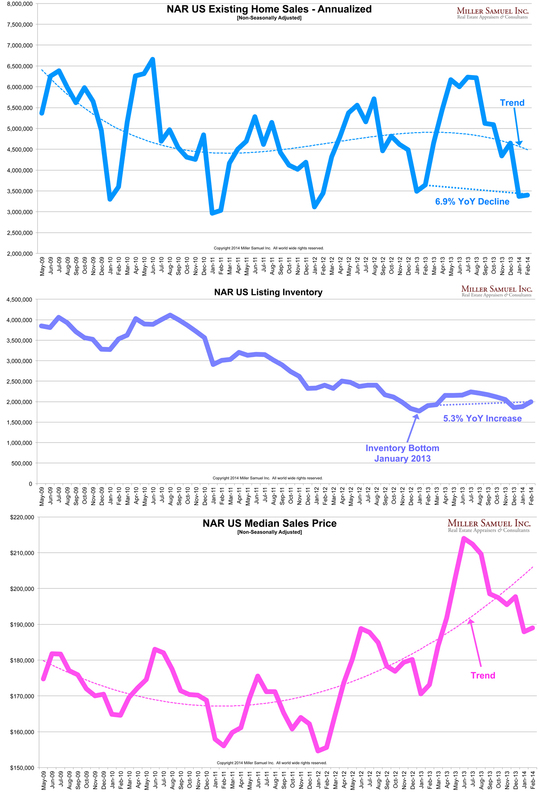 I selected average sales price to exaggerate the trend to make my point. 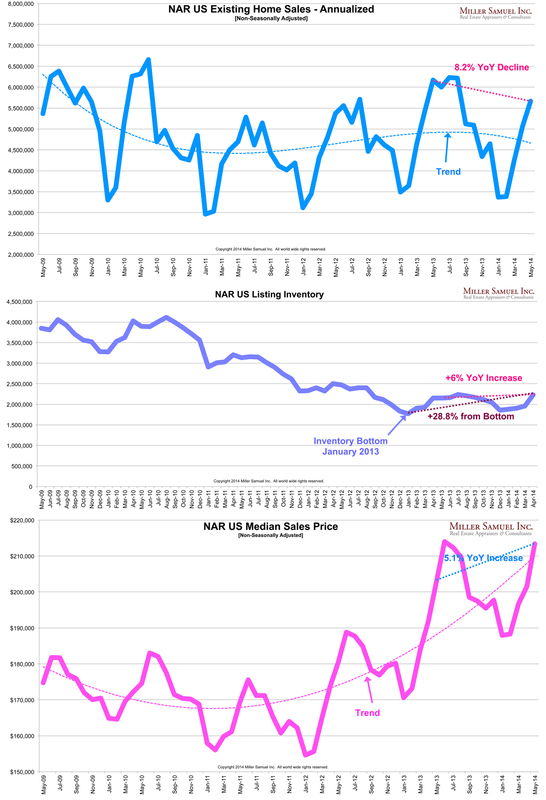 I always like to parse out press release of the NAR Existing Home Sales Report using their data but presented it with proper emphasis. 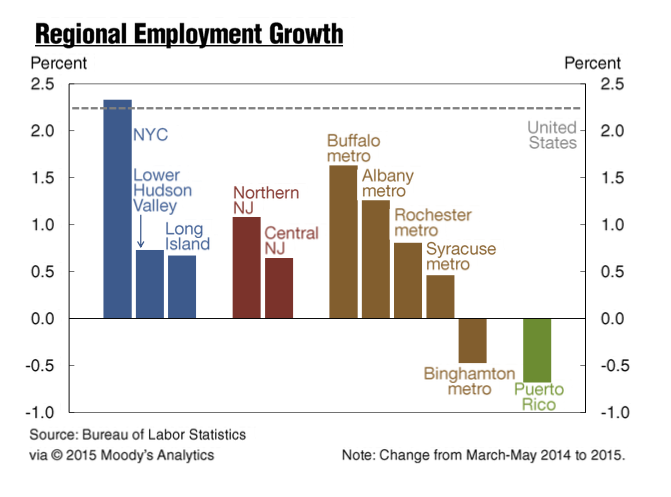 I believe these charts are better ways to interpret the report results. My two big rules: ignore seasonal adjustments and focus on year-over-year results. The consumer doesn’t know that the EHS report results are heavily adjusted rather than providing the actual results. Since the annual sales figure is a multiplier of a monthly figure, why do we need to alter the actual numbers any more by adjusting for seasonality? 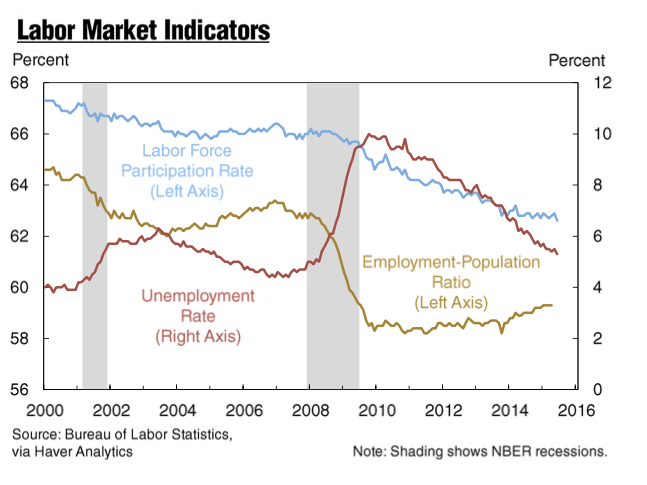 Through recent periods like the possible expiration of the Bush tax cuts (end of 2010), the federal homeowners tax credit for new buyers and existing home buyers as well as the expiration of the fiscal cliff at the end of 2012, seasonal adjustments are subject to maddening skew. It’s good to see the pace of the market returning to more sustainable conditions – last year’s market was not normal with rapid price growth and tight supply. 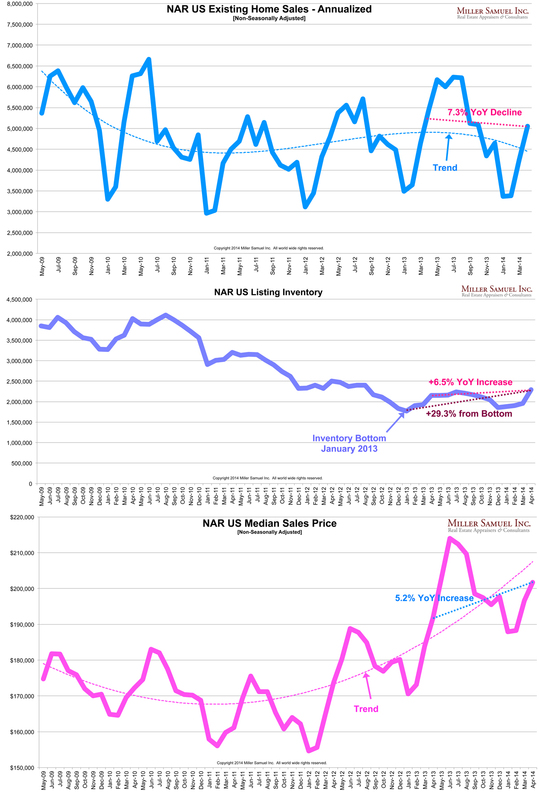 Now we are seeing inventory return to the market and rate of price growth is easing. Both are good news. 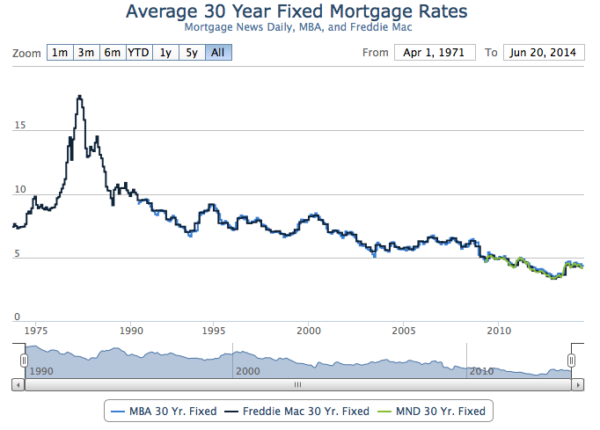 Mortgage rates have slipped but still not to the lows of early 2013. 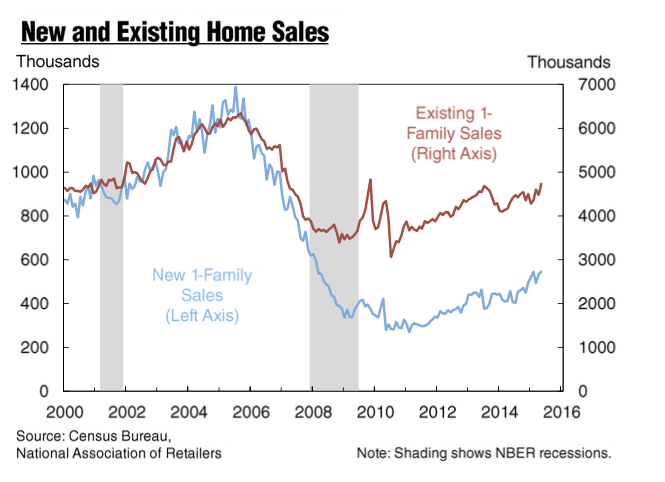 Falling rates not helping sales rise because last year was a release of years of pent-up demand. First time buyers are still not as active as they need to be, with their share down to 27% from 29%. Typically they shold account for at least 1/3 of the market. Tight credit and tough job market are reasons (not a lifestyle changes). 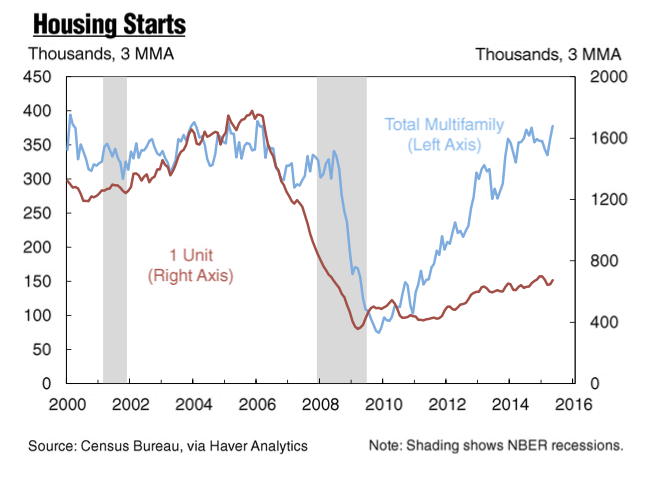 Last week we were given another dose of housing news – housing sales didn’t go negative for the first time in four months (m-o-m) as inventory continued to expand and prices kept rising. Even though mortgage rates are down to what they were shortly after the rate spike last spring, it’s not stimulating much of an increase in sales activity (translation: no correlation between housing prices and mortgage rates). I still refer to Nick Timiraos’ epic post of charts last month. 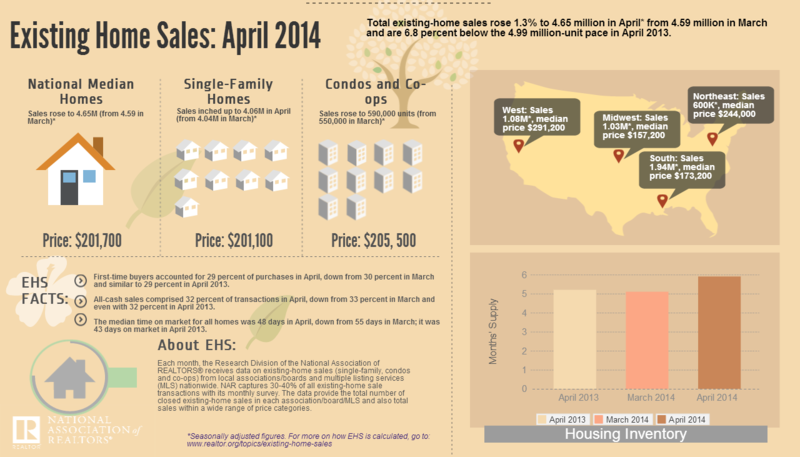 Lower sales will continue to expand inventory and take the edge off of price growth. Looking back over 2013 – the housing market wasn’t “recovering” – prices were rising from the perfect storm of tight credit, sentiment that things were getting better, surviving the fiscal cliff and threat of rising mortgage rates. The market was rebounding off a low point that had nothing to do with fundamentals. I still think we will see some improvement over the next several years but it will be nominal until the economy shows real improvement i.e. jobs, income and credit. UPDATE Here’s a wonky explanation from the Federal Reserve Bank of San Francisco of the existing sale slow down in their Economic Letter. 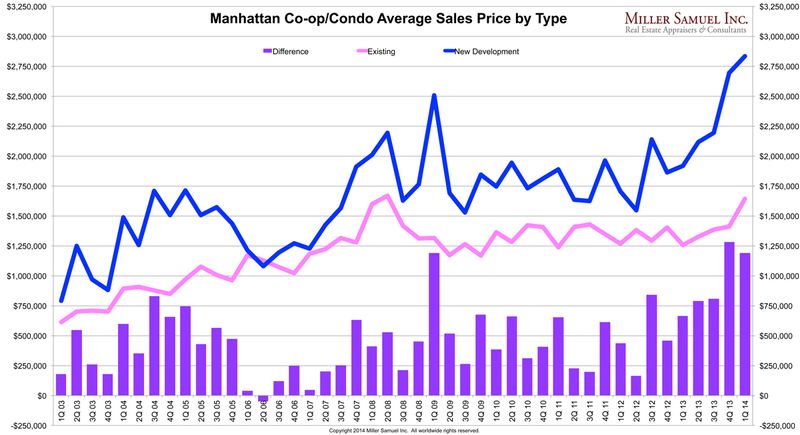 After separating new development data from existing sales from our 1Q14 Manhattan sales report, the high end new development product that is beginning to close now and pushing overall prices to record levels. After slipping in June, NAR’s Existing Home Sales for July jumped 6.5% unexpectedly from the prior month. Last month the results showed an slight decline (and were adjusted downward for this release) and the thinking was that the market is starting to cool off with the introduction of rising rates to the market in May. The bulk of May contracts probably closed in July, the likely basis of this most recent release. However it looks like the market continued to see a rise in demand in June, following the May bump in rates as people looked to get in the market before rates rose further. Still, this month over month stuff is pretty ridiculous to place a lot of faith in. The year over year surge of 20.7% (non-seasonally adjusted) and 17.2% jump (seasonally adjusted) is much more telling of the long term market change. Here are a few other charts to review. 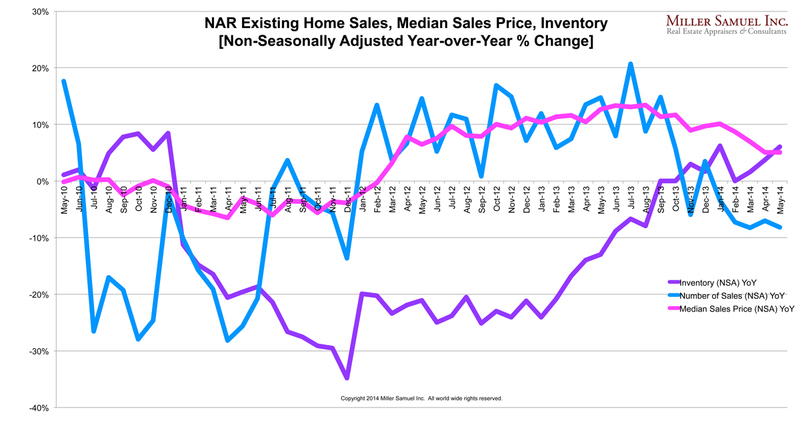 Inventory is much lower than a year ago while showing some gains in excess of seasonal trends. 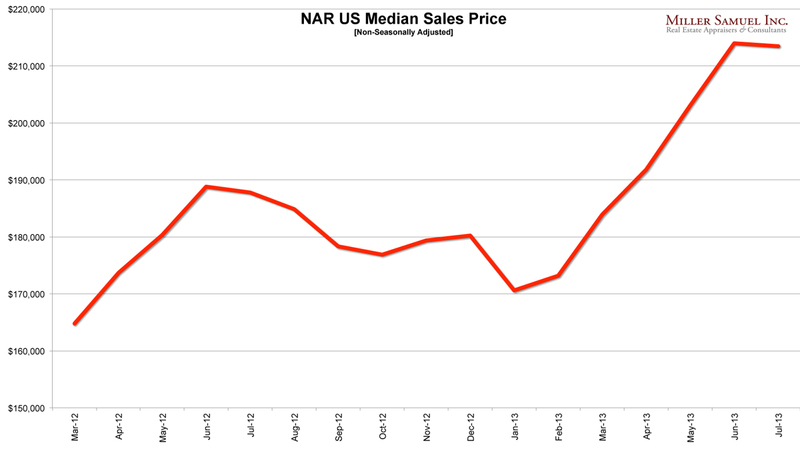 Median sales price growth is off the hook. 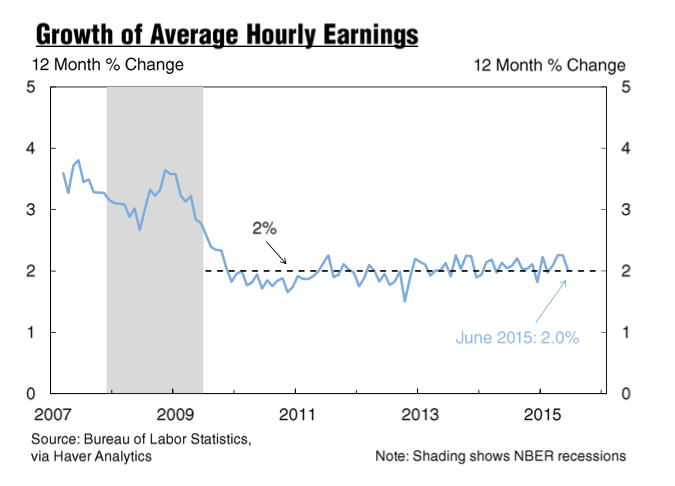 13.7% YoY growth is not sustainable with flat income, tight credit and high unemployment and underemployment. Thanks goodness for rising rates. 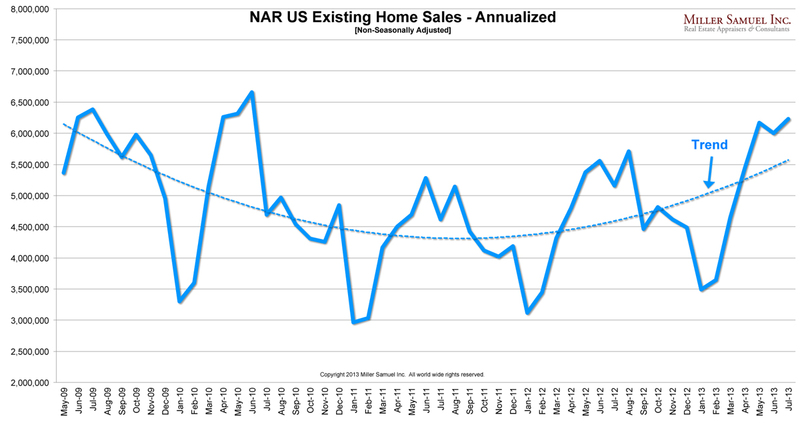 Well, NAR released the August 2012 existing home sale numbers today. Yawn. 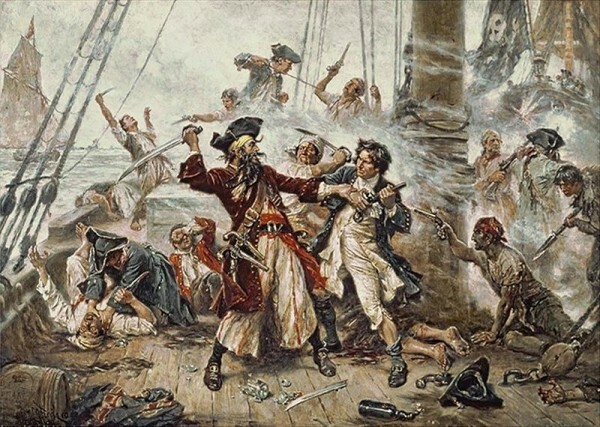 More importantly, it’s International Talk Like A Pirate Day and I’ve marked this day on my calendar for nearly as long as the 10-year run it’s had. Just mentioning the annual event to my kids makes them worry about me and yet be embarrassed for me at the the same time. For more about this important holiday, you can get the story and go right to the founder’s web site.